The Copper Promise is a classic fantasy romp, a sword and sorcery tale of epic quests, fallen heroes, plucky sellswords and fearsome dragons. After unwittingly unleashing an ancient horror from a buried citadel, three unlikely heroes – noble Lord Frith, his family murdered and himself tortured after being overthrown by rivals; Sir Sebastien, an exiled knight with a troubled soul; and Wydrin, a sassy mercenary also known as the Copper Cat – must seek out long-lost magic in order to atone for their mistake and save the world. Williams’ story is a lot of fun, full of action and magic and just the right amount of grit and gore, and it’s entertaining enough to make you overlook the many instances of deus ex machina (need to travel somewhere in a hurry? Of course, take these magical flying griffins!). The reader is often forced to suspend their disbelief even more than is usual for a fantasy novel, as several threads of the story are so contrived as to be reminiscent of quests in a Dungeons & Dragons game, but again the flighty pace and likeable characters (particularly Wydrin) will make you more than happy to turn a blind eye. The pacing of The Copper Promise does suffer a little bit from its uneven structure. As I understand it the story was originally written as a series of four novellas, and this version of the book is similarly split into four distinct sections. While this means for quite fast pacing and lots of exciting moments and mini-climaxes, it does make the final events of the book seem a little anti-climactic, although the wild chase through the skies was still very exciting, if a little rushed. Most of all, it’s nice to read the first book in a series that can actually be read as a standalone. Far too many fantasy authors recently have cut me up with sudden and dramatic cliffhangers at the end of their books (I’m looking at you, Brian McClellan), and The Copper Promise is refreshing in that it is somewhat self-contained and ends with a sense of resolution, while at the same time inviting (rather than forcing) a sequel. Nonetheless, I’m pleased to learn that there will be a sequel, as there are a few plotlines not entirely resolved (such as Bezcavar, Ip and O’rin), and interesting things mentioned once or twice but then never heard from again (such as Wydrin’s pirate mother and her father’s disappearance). I hope these will at least make an appearance in The Iron Ghost when it’s released, and can’t wait to read more about the Copper Cat and company. Great review! 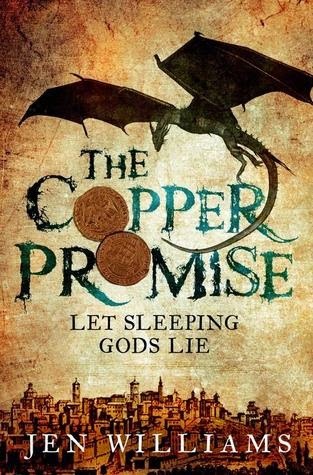 I've been meaning to read The Copper Promise for a while now, sadly I'm still on hold for it at the library, hehe. I agree, this was a lot of fun! I heard such great things about it I bought it from the Book Depository earlier this year because it wasn't out in the US yet, and it was a great purchase. I agree the format is a bit distracting, but going in knowing it was originally four novellas helped a lot, and in the end I was probably more impressed that she was able to essentially write four separate stories each with its own character and plot focus and still have it come together to make one really good "big" story!